Gastric cancer which usually affects older people is the third leading cancer responsible for cancer related deaths. Chemotherapy used to treat gastric cancer usually fails due to the development of multidrug resistance. The aim of our work is to develop a strategy that overcomes the chemo resistance in gastric cancer cells which enhance the efficacy of doxorubicin by curcumin as a potent PGP inhibitor. In this study we generated a doxo resistant gastric cancer cell line (Doxo-SNU-5) with IC50 22 μM as compared to its wild type with IC50 2.2 μM. The resistance developed was due to overexpression of Pglycoprotein, MRP1 and BCRP confirmed by RT-PCR. Doxo-SNU-5 cells when treated with non-toxic dose of curcumin (PGP inhibitor) in combination with doxorubicin IC50 was reduced up to 5 μM and decreased the cologenetic property. Morphological analysis by DAPI staining showed that the death was due to apoptosis that was further confirmed by annexin V FITC. The biochemical changes of apoptosis was confirmed by increased expression of pro-apoptotic proteins which was due to increase in the expression of CHEK2, BAX, γH2AX and decrease in the expression of anti-apoptotic gene (BCL2) in Doxo-SNU-5 as shown by RT-PCR. These results strongly supports the idea that Curcumin as a Pgp inhibitor enhances the sensitivity of doxorubicin in chemo resistant gastric cancer cell line. Chemo resistance, Doxorubicin, Doxo-SNU-5, Curcumin, PGP inhibitor, Apoptosis. Gastric cancer also known as stomach cancer develops from the lining of the stomach and is still third leading cause of cancer mortality in China and one of the leading cause of cancer deaths worldwide with 750000 deaths reported worldwide in 2012 [1-3]. One of the significant treatment options for gastric cancer is chemotherapy, but the adequacy of chemotherapy for gastric cancer impoverished due to development of Multidrug Resistance (MDR) . It’s this development of MDR that makes the determination of secondline therapy way more difficult . Moreover, no definitive findings are there as such that will indicate the best strategy for choosing the suitable substitutes for chemo-resistant tumours . Doxorubicin is used in chemotherapy for gastric cancer since ages and is usually given in co-administration with 5- flurouracil and mitomycin-C with an aim to block Multidrug Resistance (MDR) . The use of these anticancer drugs has improved the effect of chemotherapy, however most tumours acquire MDR after undergoing consecutive treatments . As a result, it is important to look for new agents that may be used to enhance the anti-cancer effects of mostly existing chemotherapeutic drugs used for gastric cancer treatment [9,10]. Because of the best history of natural product compounds regarding the production of anticancer compounds, as over two-thirds of anti-cancer drugs that are novel have been discovered are of natural origin and have attracted the attention of researchers . Natural compound like curcumin, a Chinese traditional medicine have shown potent anti-cancer activities in previous studies . Curcumin (diferuloylmethane) is isolated from rhizome of Curcuma longa having wide range of biological activities of curcumin is thought to be anti-diabetic effects, anti-inflammatory, antioxidant, and anti-angiogenic . Previous studies have revealed that the expression of oncogenes, cytokines, transcription factors and growth factors was modulated in the anti-cancer effects of curcumin [14-16]. CHEK2, a tumour suppressor gene whose functions are pivotal to the induction of apoptosis and cell cycle arrest following DNA damage is usually mutated in gastric cancer . However mutations in CHEK2 have been linked with many cancers such as breast and prostate cancers, but the relationship between CHEK2 and gastric cancer has not been studied exclusively . Generation of resistant cell lines can be used as effective models to understand the mechanism underlying MDR. However there have been only a few reports regarding this so far . The aim of this study was to develop a doxo resistant gastric cancer cell line (Doxo-SNU-5) in which the breakage of chemo-resistance was the prime focus. In present study curcumin as a Pgp inhibitor was used to break the chemoresistance in Doxo-SNU-5 cells and it was found that Curcumin potentiates doxorubicin induced cytotoxicity in Doxo-SNU-5 by apoptosis. Rose well park Memorial Institute medium (RPMI 1640), doxorubicin, MTT (3-(4,5-dimethylthiazol-2-yl)-2,5- diphenyltetrazoliumbromide), Hanks buffer, RIPA (Radioimmunoprecipitation assay buffer), protease inhibitor cocktail, curcumin with >99% purity and Rhodamin-123 were purchased from Sigma (St. Louis, MO, USA). Foetal bovine serum was purchased from GIBCO. Annexin V FITC and RNase were purchased from Santa Cruz biotechnology. RT PCR kit, Trizol reagent, primer and probe were purchased from Invitrogen. Gastric cancer cell line SNU-5 was obtained from ATCC (American Type Culture Collection). Increasing concentration of doxorubicin in parental SNU-5 cells developed MDR sub line. Parental SNU-5 was exposed to increasing concentration of anticancer drug doxorubicin for the development of MDR cell line (Doxo-SNU-5) over a period of 5 months. Cells were grown in Rose well park Memorial Institute medium (RPMI 1640) with 10% FBS and incubated in 5% CO2 incubator with 37˚C temperature. The medium for Doxo-SNU-5 was further supplemented with Doxorubicin (1 μM). Before two days of experiments, Doxo-SNU-5 cells were cultured in a drug free medium. At a density of 1.5 × 104 and 1 × 104 per well, Doxo-SNU-5 and SNU-5 were plated in 96 well plates respectively and kept overnight in CO2 incubator with 5% CO2 at 37˚C temperature. Then after 24 hr cells were treated for 48 hr with curcumin and doxorubicin containing normal cell media at desired concentration. After 48 hr 20 μl of MTT was added into each well at a concentration of 2.5 mg/ml and cells were incubated as such for 4 hr. Finally after removing media from the desired wells 150 μl of DMSO was added and absorbance was taken at 570 nm using synergy MX plate reader and cell viability was calculated. In 96 well plates Doxo-SNU-5 was seeded at a same density per well as in cytotoxicity assay and cells were allowed to grow for 24 hr. In Hanks' buffer containing 20 μM of Rh-123 as a PGP substrate cells were incubated with 30 μM of curcumin for 120 min. Cells were washed four times with cold PBS after removal of test compound followed by 150 μL of cell lysis buffer (RIPA buffer). Fluorescence of Rh-123 from 100 μL of lysate was taken at 485/529 nm by synergy MX plate reader. Florescence of sample were normalised by dividing total protein present in the lysate. 1 × 106 cells were plated in 6 well plates and treated with desirable concentration of doxorubicin in combination with curcumin for 48 hr. After 48 hr cells were harvested and washed 4 times with cold PBS. Cell suspension was performed to measure the intrinsic florescence of doxorubicin at an excitation of 488 and emission at 550 by using FACS BD Calibur flow cytometer. Fluorescence intensity was measured by histogram at 20,000 cells per event. Cell Quest Pro software was used to analyse the data. 1 × 106 cells were plated in 6 well plates and treated with doxorubicin both in presence as well as absence of curcumin for 48 hr. in brief cells were harvested and fixed in methanol and acetic acid (3:1 ratio respectively) and kept overnight at 4˚C. After overnight incubation cells were centrifuged, resuspended in methanol and acetic acid and then plated on chilled glass slides. After drying the slides, cells were stained with DAPI (1 μg/ml) in dark for 30 min and then slides were washed. Finally images were taken at fluorescence microscope. Cells were seeded in 6 well plates, treated with doxorubicin alone and in combination with curcumin for 48 hr. After 48 hr cells were trypsinized and replated at a density of 500/well for 21 days. Cells were washed with cold PBS and allowed to fix in 4% paraformaldehyde for 10 min. The living cells were stained with 0.06% crystal violet and images were taken by Olympus Tokyo, Japan camera. Cells were plated in 6 well at a density of 0.8 × 106 for 48 hr followed by treatment with doxorubicin in presence and absence of curcumin. After 48 hr treatment, cells were harvested by centrifugation at 400 G for 5 min and washed with cold PBS. These cells were incubated with binding buffer containing Annexin V-FITC for 20 min in dark. Cells were incurred by flow cytometer (FACS Calibur) for 20000 events as to analysing apoptotic and non-apoptotic population. The BCRP, MRP1, PGP, CHEK2, BAX, BCL2, γH2AX and P53 mRNAwas examined by real time PCR. Doxo-SNU-5 cells were seeded at a density 1 × 106 cells/well into 6 well plates and treated with 30 μM and 1 μM of curcumin and doxorubicin (combined treatment). Trizol reagent from invitrogen was used for total RNA isolation following manufacturer’s protocol. RNA was reverse-transcribed using oligo (dT), Deoxynucleoside Triphosphate (dNTP) and Moloney murine leukaemia virus reverse transcriptase (invitrogen) as described by the standard methods [20,21]. Briefly the following forward and reverse respectively primers used were PGP F; 5'- GACTATGCCAAAGCCAAAATAT-3' and 5'- CTTCCAATGTGTTCGGCATTAG-3', CHK2; 5'- GCGGTCGTGATGTCTCGG and 5'- TTCGTGTTCAAACCACGGA-3', p53; 5'-ATT-TGA-TGCTGT- CCC-CGG-ACG-ATA-TTGAA(S)C-3' and 5'-ACC-CTTTTT- GGA-CTT-CAG-GTG-GCTGGA-GT(S)G-3', MRP; 5'- TCTGGGACTGGAATGTCACG-3' and 5'- CAGGAATATGCCCCGACTTC-3' BCRP; 5'- CAGGTCTGTTGGTCAATCTCACA-3', and 5'- TCCATATCGTGGAATGCTGAAG-3', H2AX; 5'TGGAAAGGGTCAGGGAACG-3' and 5'- GACTTGTGCTGGTATCTGGGTG-3', BCL-2; 5'- TCCGATCAGGAAGGCTAGAGTT and 5'- TCGGTCTCCTAA-AAGCAGGC-3', BAX; 5'- CCGCCGTGGACACAGAC and 5'- CAGAAAACATGTCAGCTGCCA-3', GAPDH; PGP5'- GAAGGTGAAGGTCGGAGTCA-3' and 5'- GAAGATGGTGATGGGATTTC-3'. Each reaction was performed in triplicates. Briefly samples were heated for 2 min at 50˚C and for 10 min at 95˚C and then at 95˚C, 40 cycles of amplifications were done for 15 sec and for 1 min at 60˚C. Fluorescent signal was determined by Using sequence detector TM software and CT values i.e. threshold Cycle Number (CT) was determined. Finally for all genes the CT value was calculated by calculating the differences in their respective GAPDH mRNA and CT values. Values of three independent experiments are shown as mean ± SD of three independent experiments. Students test were used for comparison of three experiments that was performed. Treated and untreated samples were compared. P˂0.05 was considered to be a statistically significant. Graph pad prism versions 5 were used to perform Statistical analyses. In order to overcome chemo resistance in gastric cancer we have selected SNU-5 cell line for development of resistance over a period of four months. During this period the cells were treated with doxorubicin from lower concentration (0.5 μM) up to high concentration (30 μM). After four months the IC50 was again calculated in both cell lines. In wild type (SNU-5), IC50 was calculated as 2.2 μM, which got increased in Doxo-SNU-5 up to 22 μM as shown in Figure 1. It was seen that the resistance was due to up regulation of efflux pumps as was observed by overexpression of genes of major efflux pumps like BCRP, MRP1 and PGP as shown by RT-PCR in Doxo- SNU-5 as compared to wild type SNU-5 as shown in Figure 2. Figure 1: MTT assay of doxorubicin against SNU-5 and Doxo SNU-5: Both SNU-5 and Doxo SNU-5 were treated with different concentrations of doxorubicin (0.25-80 μM) for 48 hrs, wherein viability of Doxo SNU-5 was clearly less inhibited as compared to its wild type SNU-5 implying the effect of drug resistance. Figure 2: Doxorubicin enhanced PGP, MRP1 and BCRP levels: Both SNU-5 and Doxo SNU-5 cells were taken, RNA was isolated and expression of PGP, MRP1 and BCRP was determined by RT PCR. The results clearly indicated that Doxorubicin increases the expression of PGP, MRP1 and BCRP. To investigate curcumin as a potent PGP inhibitor, rhodamin123 based assay was done. The intracellular accumulation of rhodamin 123 increased by 60% in curcumin treated Doxo-SNU-5 cells as compared to untreated control at a concentration 30 μM, elacridar was taken as a positive control as shown in Figure 3. Curcumin was non-toxic on 30 μM for 48 hr which was confirmed by cell viability assay (MTT assay) as shown in Figure 4. Effective PGP inhibition by curcumin was shown at 30 μM, thus this concentration were carried for further study. Figure 3: PGP inhibition by curcumin in Doxo-SNU-5: curcumin treatment of Doxo SNU-5 results in the decrease in the activity of PGP as was seen by intracellular accumulation of Rh-123/protein. Statistical comparisons were made between control vs. inhibitors by using bonferroni method. The p value<0.05 was considered to be significant. P-value *<0.5, **<0.01,***<0.001. Figure 4: Effect of curcumin on the Viability of Doxo-SNU-5: Doxo- SNU-5 seeded treated with increasing concentrations of curcumin for 48 hours and cell viability was assessed by MTT. 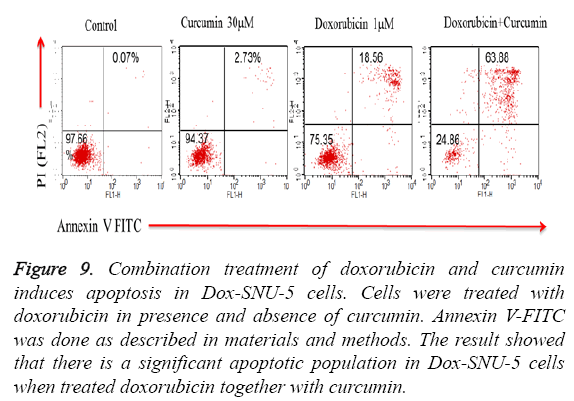 To investigate the role of curcumin in an intracellular accumulation of doxorubicin in Doxo-SNU-5 cells, cells were seeded in 6 well plates and treated with doxo in presence and absence of curcumin. Treated cells were acquired through flow cytometry in which there is an evident that fluorescence produced by doxorubicin is directly proportional to the amount of doxo accumulated inside the cells as doxorubicin is an autofluorescent drug. Interestingly curcumin enhanced the cellular uptake of doxorubicin which is by PGP inhibition when compared to untreated and doxo treated cells alone as evident by flow cytometry histogram as shown in Figure 5. 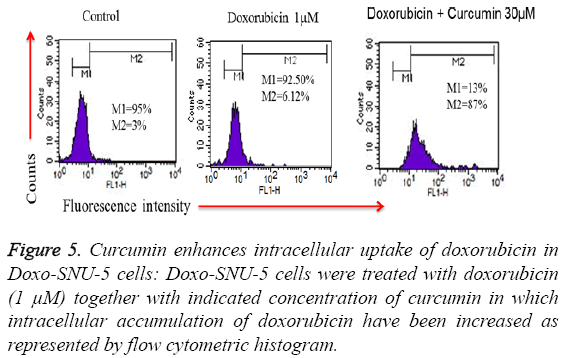 Figure 5: Curcumin enhances intracellular uptake of doxorubicin in Doxo-SNU-5 cells: Doxo-SNU-5 cells were treated with doxorubicin (1 μM) together with indicated concentration of curcumin in which intracellular accumulation of doxorubicin have been increased as represented by flow cytometric histogram. To study adverse effect of curcumin on Doxo-SNU-5 cells, preliminary experiments were done for combination treatment as to obtain a dose showing no toxicity. Curcumin does not affect cell survival as measured by MTT assay up to 100 μM as shown in Figure 4. Additionally, the use of doxo at marginal dose for combination treatment (curcumin+doxo) in Doxo- SNU-5 cells was calculated to be 1 μM. We assessed the effect of curcumin by combining with doxorubicin on gastric resistant carcinoma (Doxo-SNU-5) cells in vitro. Cells were treated with curcumin (30 μM) in combination with various doses of doxo for 48 h. As observed, at various doses of doxorubicin, viability of cells reduced from 22 μM to 5 μM as shown in Figure 6. Enhanced cytotoxic effect by doxorubicin in combination with curcumin was also confirmed by decrease in colony formation potential as shown in Figure 7. Thus the above result indicates that effect of doxo in combination with curcumin was enhanced as confirmed by inhibition of cell proliferation. 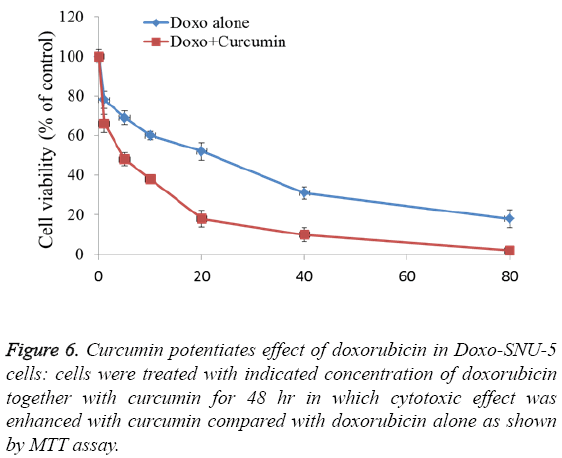 Figure 6: Curcumin potentiates effect of doxorubicin in Doxo-SNU-5 cells: cells were treated with indicated concentration of doxorubicin together with curcumin for 48 hr in which cytotoxic effect was enhanced with curcumin compared with doxorubicin alone as shown by MTT assay. 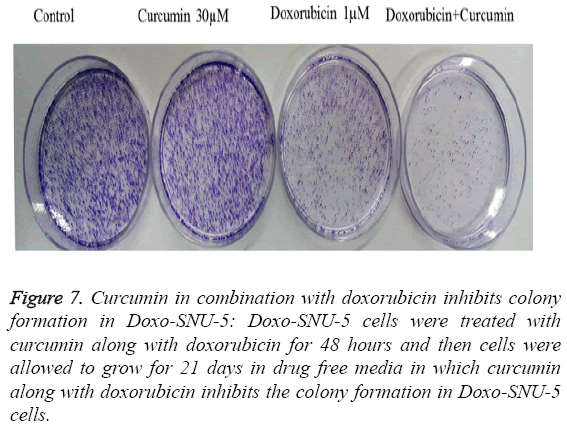 Figure 7: Curcumin in combination with doxorubicin inhibits colony formation in Doxo-SNU-5: Doxo-SNU-5 cells were treated with curcumin along with doxorubicin for 48 hours and then cells were allowed to grow for 21 days in drug free media in which curcumin along with doxorubicin inhibits the colony formation in Doxo-SNU-5 cells. PGP inhibitory effect of curcumin potentiated DOX induced effect was due to induction of apoptosis in Doxo-SNU-5 cells as evident by nuclear morphology (DAPI staining) in which there was numerous apoptotic fragments in combined treated cells (Doxo+curcumin) when compared to alone as shown in fluorescence microscopy as shown in Figure 8. Results were confirmed by annexin V FITC in which the apoptotic population was 63.88% in combined treatment (Doxo +curcumin) as compared to individual treatment of doxorubicin which is only 18.56% as shown in Figure 9 and with real time PCR as shown in Figure 10 in which gene expression of anti-apoptotic gene Bcl-2 and apoptotic gene chek2, BAX, γH2AX and P53 increased as compared to doxo alone. All the above results demonstrate that curcumin potentiates DOX induced cytotoxicity in gastric carcinoma (Doxo-SNU-5) by apoptosis. 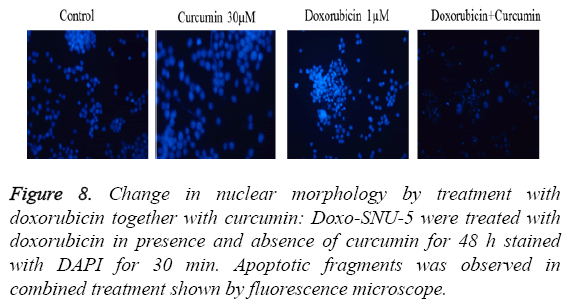 Figure 8: Change in nuclear morphology by treatment with doxorubicin together with curcumin: Doxo-SNU-5 were treated with doxorubicin in presence and absence of curcumin for 48 h stained with DAPI for 30 min. Apoptotic fragments was observed in combined treatment shown by fluorescence microscope. Figure 9: Combination treatment of doxorubicin and curcumin induces apoptosis in Dox-SNU-5 cells. Cells were treated with doxorubicin in presence and absence of curcumin. Annexin V-FITC was done as described in materials and methods. The result showed that there is a significant apoptotic population in Dox-SNU-5 cells when treated doxorubicin together with curcumin. Figure 10: Gene expression profile by doxorubicin along with curcumin: Dox-SNU-5 cells were treated with doxorubicin in presence and absence of curcumin for 48 h. RT PCR was done as described in materials and methods. These results indicate that there is up regulation of CHEK2, BAX, γH2AX, P53 and down regulates BCL2 genes. Chemo-resistance is one of the major challenges that everyone is facing nowadays as every cancer initially responds well to drugs but then develops resistance over a period of time. Chemo resistance is also one of the major hurdles in the treatment of gastric cancer, 2nd leading cause of cancer related deaths worldwide after lung cancer . MDR has been attributed to the presence of molecular pumps in tumour cells that vigorously expel chemotherapy drugs from the cells. These pumps help the cells to avoid the toxic effect of the chemotherapy drugs and continue the molecular processes going on within the nucleus and cytoplasm. The three main pumps commonly found responsible for chemo resistance are P-glycoprotein, BCRP and multidrug resistance associated proteins. In this study we generated a resistant cell line Doxo- SNU-5 so as to look for the genes involved in resistance. It was seen that there was a particular set of genes which got up regulated due to resistance; the genes involved are BCRP, MRP1 and PGP. Curcumin a natural product inhibited the expression of PGP in Doxo-SNU-5 cell line so that intracellular accumulation of doxo have been increased as shown by flow cytometer histogram in which viability and colony formation had decreased. Increased cytotoxic effect of doxo by curcumin was due to induction of apoptosis in Doxo- SNU-5 cells, as was shown by nuclear morphological changes and annexin V FITC. These results were further confirmed by Real time PCR in which gene expression of antiapototic gene Bcl-2 decreased and apoptotic gene chek2, BAX, γH2AX and P53 increased as compared to doxorubicin alone. In MDR studies, it was shown that curcumin is the most active Pgp inhibitor and increases vinblastine cytotoxicity in Pgpexpressing MDR cancer cells. Therefore, this continued research has been focussed more on the MDR reversing properties of curcuminoids using many kinds of chemotherapeutic drugs such as paclitaxel, doxorubicin, etoposide, mitoxantrone and topotecan. In addition, the effects of formulated curcuminoids, curcumin, demethoxycurcumin and bisdemethoxycurcumin on these drug accumulation and efflux in high and low Pgp expressing on MDR phenotypes or the changes in drug sensitivity of MDR cells were also investigated. Therefore our study confirms Curcumin enhanced the efficacy of doxorubicin in Doxo-SNU-5 through inhibition of Pgp and thus helped in breaking the chemo resistance. Thus curcumin can be used as a potential drug candidate to overcome chemo resistance in gastric cancer. Alberts SR, Cervantes A, van de Velde CJ. Gastric cancer: epidemiology, pathology and treatment. Ann Oncol 2003; 14 Suppl 2: ii31-36. Wu B, Zhang Q, Shen W, Zhu J. Anti-proliferative and chemosensitizing effects of luteolin on human gastric cancer AGS cell line. Mol Cell Biochem 2008; 313: 125-132. Sun X, Mu R, Zhou Y, Dai X, Qiao Y. 1990-1992 mortality of stomach cancer in China. ZhonghuaZhong Liu ZaZhi 2002; 24: 4-8. Volm M, Efferth T. Prediction of Cancer Drug Resistance and Implications for Personalized Medicine. Front Oncol 2015; 5: 282. Zhang D, Fan D. New insights into the mechanisms of gastric cancer multidrug resistance and future perspectives. Future Oncol 2010; 6: 527-537. Roth AD, Herrmann R, Morant R, Borner MM, Honegger HP. Cisplatin, doxorubicin and etoposide (PAV) in advanced gastric carcinoma: the SAKK experience. Swiss Group for Clinical Cancer Research (SAKK). Eur J Cancer 1998; 34: 2126-2128. Gillet JP, Gottesman MM. Mechanisms of multidrug resistance in cancer. European J pharmasci Meth MolBiol 2010; 596: 47-76. Rajesh K, Lawrence DM. Multidrug Resistance (MDR) in cancer: Mechanisms, reversal using modulators of MDR and the role of MDR modulators in influencing the pharmacokinetics of anticancer drugs.SprAusgabeCancChemoterOncol 2006; 58: 99-106. Ajani JA. Evolving chemotherapy for advanced gastric cancer. Oncologist 2005; 10: 49-58. Van Cutsem E. The treatment of advanced gastric cancer: new findings on the activity of the taxanes. Oncologist 2004; 9: 9-15. Zhang X, Chen LX, Ouyang L, Cheng Y, Liu B. Plant natural compounds: targeting pathways of autophagy as anti-cancer therapeutic agents. Cell Prolif 2012; 45: 466-476. Yin SY, Wei WC, Jian FY, Yang NS. Therapeutic applications of herbal medicines for cancer patients. Evid Based Complement Alternat Med 2013; 302426-302427. Priyadarsini KI. Chemical and structural features influencing the biological activity of curcumin. Curr Pharm Des 2013; 19: 2093-2100. Lin JK. Suppression of protein kinase C and nuclear oncogene expression as possible action mechanisms of cancer chemoprevention by curcumin. Arch Pharm Res 2004; 27: 683-692. Yu LL, Wu JG, Dai N. Curcumin reverses chemoresistance of human gastric cancer cells by downregulating the NF-?B transcription factor. Oncol Rep 2011; 26: 1197-1203. Lin SS, Lai KC, Hsu SC. Curcumin inhibits the migration and invasion of human A549 lung cancer cells through the inhibition of matrix metalloproteinase-2 and -9 and vascular endothelial growth factor (VEGF). Cancer Lett 2009; 285: 127-133. Teodorczyk U, Cybulski C, Wokoaorczyk D, Jakubowska A, Starzyaska T. The risk of gastric cancer in carriers of CHEK2 mutations. Fam Cancer 2013; 12: 473-478. Kuusisto KM, Bebel A, Vihinen M, Schleutker J, Sallinen SL. Screening for BRCA1, BRCA2, CHEK2, PALB2, BRIP1, RAD50, and CDH1 mutations in high-risk Finnish BRCA1/2-founder mutation-negative breast and/or ovarian cancer individuals. Breast Cancer Res 2011; 13: R20. Xiaotian Z, Masakazu Y, Hong Q. Establishment and characterization of multidrug-resistant gastric cancer cell lines. Anticancer res 2010; 30:915-921. Pandey V, Vijayakumar MV, Ajay AK. Diet induced obesity increases melanoma progression: involvement of Cav1 and FASN. Int J Cancer 2012; 130: 497-508. Sambrook J, Fritsch EF, Maniatis T. Molecular cloning: a laboratory manual. Cold Spring HarbCold Spring Harbor Lab 1989.